Most of us here in the local area have seen small roundish birds running across the roadway in front of our cars or darting off into the grass alongside the road. These tiny critters are more often than not quails, and one of the species of quails found locally is the Painted Button-quail, which is considered to be vulnerable. Button-quails are very similar in habits and look to true quails, they differ most significantly in appearance by having only 3 toes (true quail’s have 4) and in habit by the reversal of sexual roles between males and females. The female makes all the advances at mating time and does all the fighting for territorial rights. She lays 4 eggs and leaves the male to incubate the eggs and raise the young, whilst the female may wonder off to find a new mate and repeat the whole process, leaving each mate raising a family. 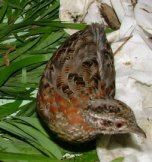 This species of Quail is also expert at performing the “broken wing” act used to lead predators away from its nest. The Painted Button-quail prefers to live in lush understorey, with a forest floor alive with bugs and grubs to feast upon. Like chickens they scratch round areas and seek out their food from under the mulch, each area scratched is only about 8 cm in diameter, just perfect for a seed to fall into and, due to their size; they provide a low impact solution for bug control on the forest floor. The female is a bright chestnut across the shoulder with crown, face and chest flecked white. The feathers on the back and wings of the Painted Button-quail are amazing; they do look like the feathers have been painted on in chestnut and black with white streaking and provide perfect camouflage when predators are near, by simply sitting down and blending into the forest floor. Button-quails are often seen in small groups foraging during the daytime together, and nesting at night by hiding in nooks amongst the leaf mulch. 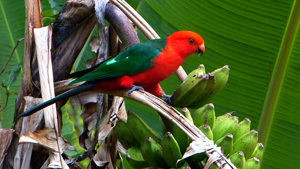 They run rather than fly, and if they fly it is just above the ground, they are rarely found perching. The young are particularly vulnerable to cat attack and are often the hit by cars as they scurry across the road, so p-lease be alert to these little guys when driving. As the Buttonquail is a vulnerable species due to habitat loss, it is wonderful to know that there are pockets of these beautiful birds locally.